Flowers to me mean Valentine's Day! I love flowers any day of the year but I especially love them as a symbol of my husband's love on Valentine's Day! They are the perfect way to brighten up our house during this long winter and I love the fragrant smell! And this year, the man even gets the chance to win something while making his woman happy too with the “Get a Room” Valentine’s Day Sweepstakes! This year, Teleflora, the world’s leading flower delivery service, is helping men sweep their sweethearts off their feet AND earn a little love for themselves while they’re at it! This year, Teleflora is putting the “man” back in “romance” by giving men who purchase one of four featured Valentine’s Day bouquets a chance to win the Ultimate Man Cave! From now until February 14, sweepstakes participants will have the chance to win $25,000 toward the Man Cave room of their dreams. Teleflora offers hand-arranged, hand-designed floral arrangements by local florists delivered directly to customers. Teleflora’s “Get a Room” bouquets have something for every budget and every expression of love. My favorite is the Teleflora’s Hearts of Gold Bouquet (Available on Teleflora.com starting at $54.95). Fill her heart with love (and your Man Cave with flat screens) with this romantic gift of ravishing red roses hand-delivered in a shimmering, satin-finish glass vase. 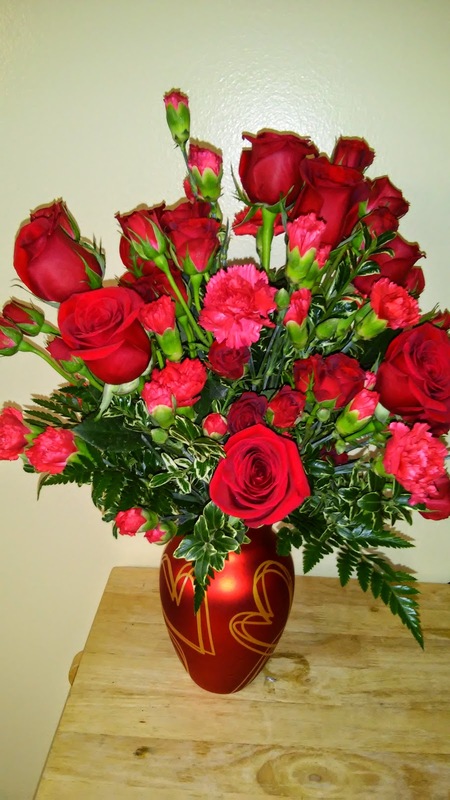 This bouquet was breathtaking and the beautiful red flowers are a perfect gift this Valentine's Day! It has brightened up my house so much during this drab winter! Breathtaking flowers for her, a magnificent Man Cave for him. It’s truly a win-win! You can purchase a beautifully-arranged floral gift, hand-crafted and delivered by a local florist anywhere in the country by visiting www.teleflora.com.